It all started as a small fundraiser to send Mark Campbell, who was diagnosed with lung cancer on Jan. 10, to fulfill a lifelong dream: to attend a Toronto Maple Leafs game. Enough money was raised through an online GoFundMe campaign to send him, his wife Heather, and four generations of his family to the game. The plan also was to donate any extra funds to Prince Edward County Memorial Hospital’s Back the Build campaign and to Hospice Prince Edward. 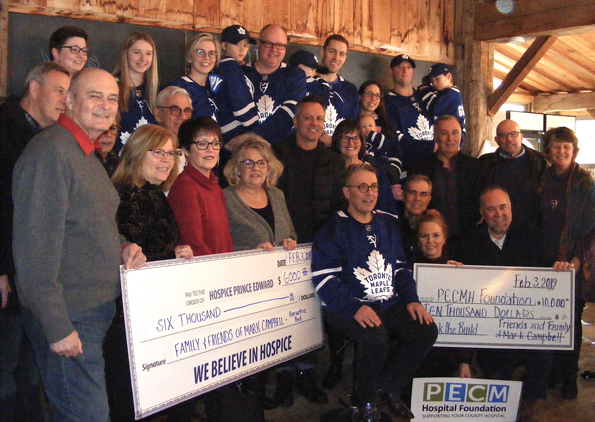 With family, friends, acquaintances and fellow County residents contributing generously, the total grew so quickly that the Bloomfield family was able to give back $6,000 to the hospice and $10,000 to Back the Build in a presentation at Karlo Estates Winery near Wellington on Sunday, Feb. 3, and the money keeps coming. As of Feb. 5, the GoFundMe campaign has raised more than $31,500, with no sign of slowing down. Vintner Sherry Karlo, who founded the winery with her late husband, Richard, who died of cancer in 2014, said hospice care meant a lot to her husband and her family as well as to all the other families who have needed or will need hospice or hospital care for a loved one, so hosting this event was important to her. “It’s such a great blessing to be able to give back to the community,” she said. Campbell’s voice was soft and he was unable to speak for long, but he was all smiles on Sunday as he was surrounded by family, friends, local politicians and a special guest, Maple Leafs great Doug Gilmour, who paved the way for the Campbells to see the Jan. 20 Leafs game in style. “The community wins by this,” Campbell said. He also promised to be back hosting his afternoon program on 99.3 County FM radio when — not if —he gets his voice and health back. “I want to continue to be strong,” he said. His wife, Heather, the palliative care co-ordinator for the Prince Edward Family Health Team, said the initial diagnosis is somewhat less dire right now. “This week, we got some encouraging news that allows us to sort of reframe what our hope is, which includes that Mark is a candidate for radiation to his lung and his brain, and also that there is a targeted chemotherapy that he will start on Tuesday (Feb. 5),” she said. She noted that, in her work in palliative care, she has known several people who did well on this treatment. “We are encouraged by that,” she said. “It makes things not so imminent as it was on Jan. 10, so we are grateful for that. 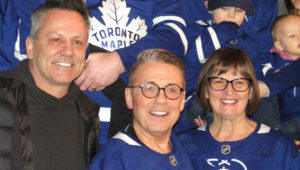 We are grateful for all of the support that we have received through Sherry, through Doug Gilmour, through our trip to Maple Leaf Gardens with our children, our grandchildren, Mark’s mom and dad and some special friends. We cannot emphasize to you enough the depth of love and care that we have received.” She encouraged people to keep spreading that love and caring towards others who have been down this path. “I just want to congratulate this community,” Gilmour said. “My son plays with the Wellington Dukes here, and I’ve known Sherry a long time. I made one phone call and Sherry pretty much did the rest.” He commented on the amazing support the Campbells have received from their family and from the entire community. People who still wish to donate can do so at https://ca.gofundme.com/cheer-for-grampy.